The Riverside Arts Academy engages youth in the creative process through the visual arts. Visual Arts is an exploratory program designed for youth who have an artistic interest and enthusiasm in the areas of visual arts, poetry and theater. Donations provide funding to support Riverside Arts Academy, enabling the program to contribute to the cultural life of the community by providing artistic and cultural activities for the diverse youth of Riverside. Riverside Arts Academy is made possible by sponsorship and donations from the community. "As a long time teacher, I appreciate the positive impact music and art have on learning and brain development. In fact, my son works in the music business, an interest that started when he was very young and fostered by teachers and family. Unfortunately, not all schools can provide broad arts and music programming, which makes organizations like the Riverside Arts Academy invaluable to our communities and deserving of our support." Conducting all around the world, maestro Gene Moon has graced the podium of orchestras on four continents over the course of his career. Beginning the fall of 2018, Dr. Moon joined the Riverside Arts Academy as Music Director. In addition to his responsibilities with the Academy, he is also on the faculty of California Baptist University serving as Director of Orchestral Studies. His recent posts have included Director of Orchestral Activities at Stephen F. Austin State University (Nacogdoches, TX), Artistic Director of the East Texas Youth Orchestras (Tyler, TX) and Music Director and Conductor of the Longview Symphony Orchestra (Longview, TX). Dr. Moon’s career has led him conducting appearances throughout the United States and overseas in Asia and South America. An avid champion of music education, he dedicates his work to inspire and train future musicians, seen through his countless work with school instrumental programs and youth orchestras, such as the East Texas Youth Orchestra program, which grew from 22 members to 120 members over the course of three years under his artistic direction. 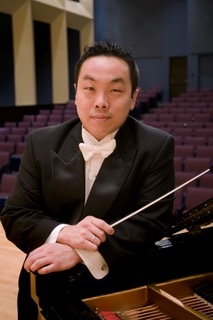 Sought after, nationally and internationally, maestro Moon has led performances with orchestras including Orquesta Filarmónica de Medellín, Gangnam Symphony Orchestra and All-State orchestras in Arkansas and Louisiana along with orchestras of the University of Macau Orchestra and Hong Kong Baptist University and many region honor orchestras and festivals throughout the United States. He is on faculty with the Sewanee Summer Music Festival and work with hundreds of young musicians from all around the world each summer. Dr. Moon’s previous posts include the faculties at the University of Central Oklahoma, University of Oklahoma, the Mid-Del school district and as music director and conductor of the Oklahoma Youth Symphonies. An avid instrumentalist, Moon actively performs as pianist and violist in the collaborative settings of chamber and orchestral music. He holds degrees from the University of Central Oklahoma, New York University and the University of Oklahoma. The list of distinguished conductors Moon has studied with include Jonathan Shames, John Jeter, and, in masterclass, with world-renown conductor, Sergiu Comissiona. His piano studies have been guided by Jan Pokorny Steele, Lee Dai Wook, Dierdre O’Donohue, Ed Gates and noted Van Cliburn medalist, Valery Kuleshov while his viola studies have been with Ralph Morris and Matthew Dane. Anthony Zamora joined the Parks, Recreation and Community Services Department in October 2006 after working for fourteen years at the Riverside Unified School District. In December of 2014, Anthony transferred to Cesar Chavez Community Center/Bobby Bonds Park as an Interim Supervisor/Coordinator. He would stay at Cesar Chavez Community Center/Bobby Bonds Park as a Coordinator for a year and a half before being promoted to Recreation Supervisor. Matt Tomjack joined the Parks, Recreation and Community Services Department in July 2011. In 2013, Matt took on the responsibility of being the Assistant Recreation Coordinator at the La Sierra Senior Center planning special events, securing donations and organizing senior programming, along with daily operation duties. In 2015, Matt was promoted to Recreation Services Coordinator for the Riverside Arts academy. Rae Ayala has been dancing Ballet Folklorico for eleven years and teaching for four. In 2014, she began instructing the classes at RAA. Born and raised in Riverside, she was a member of the Magnet Program at Ramona High School. Rae is a member of the Grupo Maya Ballet Folklorico. Ian Burke spent four years studying music and choir. He attends RCC and sang with Chamber Singers under John Byun. He is self-taught in guitar and learned to teach youth during the afterschool PRIMETIME program. In 2015, he became an instructor with RAA. He currently is instructing Guitar and Keyboard. Tremayne Muhammad learned music at an earlier age and became a volunteer for RAA. In 2015, he was hired to instruct Drum, Trumpet and Trombone. He currently is a student with Riverside City College. He has performed at Disneyland, The Rose Parade and New Year’s Parade in Paris, France. Ruth Noemy Wheeler is very well established in the music world. She has a Bachelor’s in Music from Spain and a Double Master’s from California Baptist University in violin performance and conducting. Noemy works at CBU and in 2015, she was hired as the instructor of the violin class for RAA’s youth program. Noemy is the lead instructor for the violin classes at RAA. In January 2015, Ann Kassel-Wilkes was hired to assist the arts program with funding and volunteers. However, Ann has also assisted with the development and growth of the program with her knowledge of report writing, completing data, research of grants, marketing and promotion through presentations, new classes, preparation of guidelines, etc. Daniell Williams has been working with RAA for about 4 years. She instructs various types of dance, stage techniques and voice classes. Daniell was inspired by family for her talent of the arts. Through the years, she had been involved with several groups in music and dance. Daniell is in College and her major is Early Childhood Education and Behavioral Studies. Rachel Zimmerman received her B.A. from the East Coast in Art History. She relocated to Riverside and completed her M.A. In 2016, Rachel was hired to instructor the art classes at RAA. She serves as part of the editorial team for a VASA Journal and is an adjunct art history instructor for Elon University in the LA program. Janice Cheung is a native of South Korea where she began playing cello at the age of five. She moved to the U.S. in 2000 continuing her studies at Idyllwild Arts Academy and studied under Brandon Vamos, cellist of the Pacifica Quartet at the University of Illinois at Urbana-Champaign. Her experience in orchestra and Chamber ensembles varies having played in University of Illinois Symphony Orchestra, Teheran Valley Orchestra, Bonner Singers Orchestra, and Enescu Ensemble, and others. Janice believes in the power of music as it is a language that unites people across cultures, and medicine that can comfort people in times of need and sadness. She enjoys a versatile career as a soloist, chamber musician and professional cello instructor. It is her passion to share the gift of music, the powerful stories, the joy and to inspire the young students throughout the Inland Empire. Jacob Benitez started playing violin at the age of 4. He studied Violin Performance at La Sierra University and during his time there, he started playing the viola and grew an interest for the instrument. Now he plays both violin and viola. He has loved music since day one, it is apart of him. Jacob grew up in Redlands, CA with his 2 parents. They have always supported him throughout his music career. He is happy to be apart of the Riverside Arts Academy family and is looking forward to where this will take him. A 2002 Graduate of Cal State Fullerton, Ms. Bauer earned her BA in Music Education with Vocal/Choral Emphasis. In her thirteenth year teaching secondary choir, she now holds the Choir Director positions at Frank Augustus Miller and Matthew Gage Middle Schools. Active in the community, Ms. Bauer also founded Citrus Community Singers and conducts the Riverside Arts Academy Youth Choir. Advancing her education, she completed the coursework for a MM in choral conducting at CSULA and earned her MS in Education from California Baptist University. During her free time, she finds joy in her family, crocheting and BBC murder mysteries.